Lindsey Doolittle is trying to change the stigma surrounding law enforcement suicide, drawing from the pain of her own experience. We also talk to KCKPD Chief Terry Zeigler about how suicides are handled in his department. KANSAS CITY, Kan. — "On April 22, 2015 my late husband, Sgt. Brett Doolittle of the Kansas City, Kansas Police Department, ended his life," Lindsey Doolittle said matter-of-factly. Facing the reality is what helps her survive. Doolittle came home that Wednesday evening like a regular day. She parked her car in the back garage. "That's when I saw my husband. He had ended his life. He had died by depression, but the tool that he used was helium," Doolittle said. She found Brett in the garage below the house, where he would spend time creating art. It'll be almost four years since that devastating day. "I forced myself to come down here. I mean, I live here. I force myself to do the uncomfortable so I can live," said Doolittle. Doolittle found her voice, becoming an advocate and activist. She started an organization, Above the Rug . She especially speaks out for widows whose spouses were in law enforcement, because she knows what it's like. For the third straight year law enforcement suicides drastically outnumbered line-of-duty deaths . In 2018, 159 officers ended their life. On average, the officers were 41 years old with 15 years of service. They are mostly males who are active duty and use a gun to end their life. Brett Doolittle served 16 years with KCKPD. Blue H.E.L.P and Badge of Life compiled the number of law enforcement suicides by year. Data was not available for 2014, 2013, 2011 and 2010. Badge of Life says they'll no longer collect this data going forward. "We have found that regardless of the amount of statistical predictions about unreported suicides we utilized. Ultimately these numbers were not accurate even with the best statistical projections," the website says. "It's seen as a shameful act or as a weakness, which it's none of the above. It's a mental health condition. My husband's depression exceeded his coping skills," said Doolittle. Four years later, Doolittle said she still hasn't gotten the understanding, support, and outreach from the place she may have needed it the most—Brett's police department, KCKPD. "The police department's absence not only added to my grief. I mean, I had already blamed myself but then I started to hate myself too, and I even attempted on my life," said Doolittle. After Brett's death, she wrote Police Chief Terry Zeigler a detailed 15 page letter. She talked about the months leading up to the suicide, Brett's first attempt, and the hardships he was going through. "It was so hard to write that letter and he didn't do anything," she said. On top of everything, she felt blamed when she read the police report and autopsy report noted the couple had issues in their marriage. Brett's suicide letter read, in part: "I was never supposed to be a police officer. I just wound up in this career because of dumb luck after dropping out of art college. It was you that kept me going. This occupation has aged me horribly and I believe turned me mostly into someone I am not. I also blame the stress of this career for my health issues." Chief Zeigler said he believes it. "I believe the words that he wrote in that letter are 100 percent true. He changed. He was not the same person when he joined this police department. But the only thing you can do when you walk in this profession is try to minimize the negative impact," Zeigler said. Zeigler said Brett's suicide wasn't handled the best way and doesn't like how it turned out. "We had a suicide four months into being chief, so it was a very difficult thing to deal with and the department was divided," Zeigler said. Doolittle wonders what would have happened if Brett was killed in the line of duty. Would she have gotten more support? Zeigler said his department doesn't have a stigma surrounding suicide, and he would like to think every family gets support. "What happens if you blast it out to the public and there is no outpouring of support? So then what's the message to family? Is the family going to be angry at the community? I just, I don't know. These are the issues I dealt with when this happened," Zeigler said. Doolittle said it was compassion she was looking for. It wasn't until Capt. Dave Melton and Det. Brad Lancaster were killed in the line of duty in 2016 that the department started to ramp up its mental health services. "These are drastically different situations. I can wrap my head around and understand how two officers get killed in line of duty. 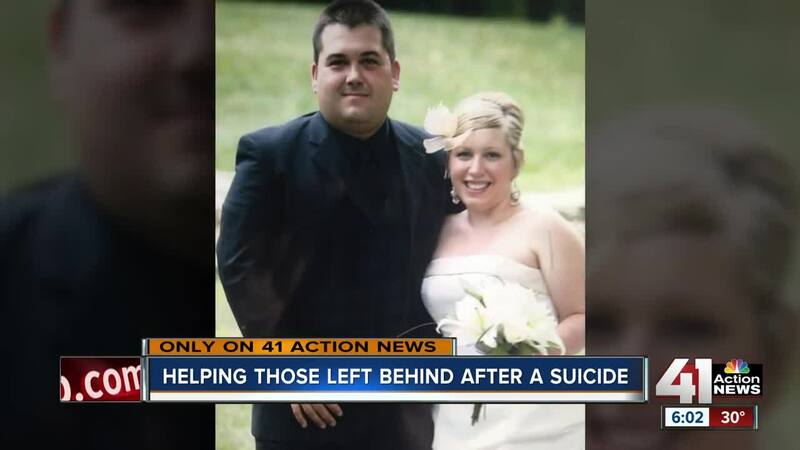 A suicide is very personal, very personal to families," said Zeigler. "You have to have answers. 'Well, this happened because of this.' So it's not very feasible to think that you're never going to have the answer to the question of, 'why?'" said Bonnie Swade. Bonnie and Mickey Swade started SASS, Suicide Awareness Survivor Support , a group that helps suicide loss survivors cope. The organization's motto is "Suicide is everyone's business." Doolittle is now a group leader. The Swades lost their own son, Brett, to suicide 14 years ago. They said the awareness now is much better than when he passed. Swade said oftentimes many loss survivors can't and won't acknowledge their loved one died by suicide. "I think you need to acknowledge that the survivor is feeling guilt, because they are. There's no way around it," Swade suggests. "But as they come to the support group and talk about it, I think they learn that they can't blame themselves for the loss. It's a matter of learning and understanding that you were there, you did the best you could at the time with the knowledge you had." Doolittle has shifted the blame from herself. "I want to let everyone know that I don't blame anyone. I don't blame his job, I don't blame our marriage, I don't blame even Brett. Brett died of mental health condition," she said. Swade said healing can begin when people stop trying to put the blame on something and start being truly willing to listen. "We managed it and did the best we can. I've tried to grow a lot since then and try to be a lot more understanding of mental health. Is it perfect? No. Will we make more mistakes? Yes," said Zeigler. Zeigler now hands out a book to his recruits, Emotional Survival for Law Enforcement by Dr. Kevin Gilmartin. Zeigler just recently started to realize the psychological impact the job had on him over 25-plus years after he read the book. "The officers have to be willing to receive help. We can't force those officers because we don't know what individual officers are struggling with mentally," said Zeigler. KCKPD has a new peer support program , where officers can talk to one another confidentially. Police departments across the metro have started a peer support program within the last couple years to emphasize taking care of their own. Doolittle said her door is always open to Zeigler and the police department. What's done is done for her; now the mission is to spread awareness so that no one sweeps suicide under the rug. "I just want widows of law enforcement suicides [to be] acknowledged and not blamed. 'Cause if it was our choice, our husbands would still be here. That was not my choice. And I don't even feel like it was Brett's choice. I don't feel like he even had a choice," Doolittle said. If you or a loved one are considering suicide, call the National Suicide Prevention Hotline at 1-800-273-8255.